In this tutorial, you take an extended look at the process of developing a predictive analytics solution. You develop a simple model in Machine Learning Studio. You then deploy the model as an Azure Machine Learning web service. This deployed model can make predictions using new data. This tutorial is part one of a three-part tutorial series. Suppose you need to predict an individual's credit risk based on the information they gave on a credit application. Credit risk assessment is a complex problem, but this tutorial will simplify it a bit. 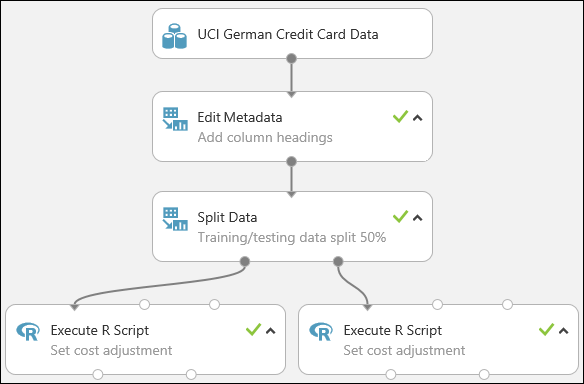 You'll use it as an example of how you can create a predictive analytics solution using Microsoft Azure Machine Learning Studio. You'll use Azure Machine Learning Studio and a Machine Learning web service for this solution. In this three-part tutorial, you start with publicly available credit risk data. You then develop and train a predictive model. Finally you deploy the model as a web service. You can then use this experiment to train models in part 2 and then deploy them in part 3. This tutorial assumes that you've used Machine Learning Studio at least once before, and that you have some understanding of machine learning concepts. But it doesn't assume you're an expert in either. If you've never used Azure Machine Learning Studio before, you might want to start with the quickstart, Create your first data science experiment in Azure Machine Learning Studio. The quickstart takes you through Machine Learning Studio for the first time. It shows you the basics of how to drag-and-drop modules onto your experiment, connect them together, run the experiment, and look at the results. 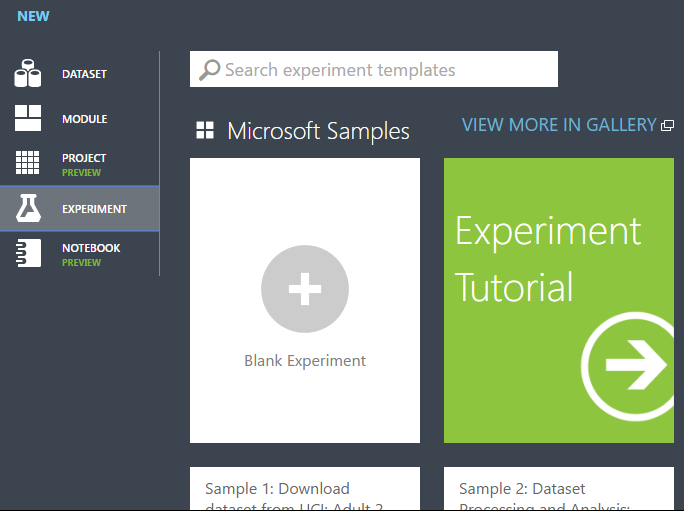 You can find a working copy of the experiment that you develop in this tutorial in the Azure AI Gallery. 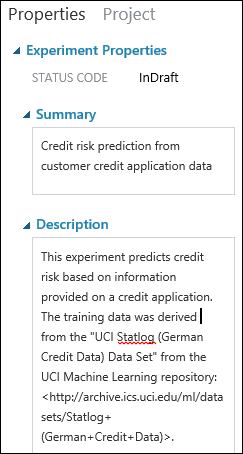 Go to Tutorial - Predict credit risk and click Open in Studio to download a copy of the experiment into your Machine Learning Studio workspace. To use Machine Learning Studio, you need to have a Microsoft Azure Machine Learning Studio workspace. This workspace contains the tools you need to create, manage, and publish experiments. To create a workspace, see Create and share an Azure Machine Learning Studio workspace. After your workspace is created, open Machine Learning Studio (https://studio.azureml.net/Home). If you have more than one workspace, you can select the workspace in the toolbar in the upper-right corner of the window. If you are owner of the workspace, you can share the experiments you're working on by inviting others to the workspace. You can do this in Machine Learning Studio on the SETTINGS page. You just need the Microsoft account or organizational account for each user. On the SETTINGS page, click USERS, then click INVITE MORE USERS at the bottom of the window. You'll use the file named german.data. Download this file to your local hard drive. The german.data dataset contains rows of 20 variables for 1000 past applicants for credit. These 20 variables represent the dataset's set of features (the feature vector), which provides identifying characteristics for each credit applicant. An additional column in each row represents the applicant's calculated credit risk, with 700 applicants identified as a low credit risk and 300 as a high risk. The UCI website provides a description of the attributes of the feature vector for this data. This data includes financial information, credit history, employment status, and personal information. For each applicant, a binary rating has been given indicating whether they are a low or high credit risk. You'll use this data to train a predictive analytics model. When you're done, your model should be able to accept a feature vector for a new individual and predict whether he or she is a low or high credit risk. The description of the dataset on the UCI website mentions what it costs if you misclassify a person's credit risk. If the model predicts a high credit risk for someone who is actually a low credit risk, the model has made a misclassification. But the reverse misclassification is five times more costly to the financial institution: if the model predicts a low credit risk for someone who is actually a high credit risk. So, you want to train your model so that the cost of this latter type of misclassification is five times higher than misclassifying the other way. One simple way to do this when training the model in your experiment is by duplicating (five times) those entries that represent someone with a high credit risk. Then, if the model misclassifies someone as a low credit risk when they're actually a high risk, the model does that same misclassification five times, once for each duplicate. This will increase the cost of this error in the training results. The original dataset uses a blank-separated format. Machine Learning Studio works better with a comma-separated value (CSV) file, so you'll convert the dataset by replacing spaces with commas. In either case, you have created a comma-separated version of the data in a file named german.csv that you can use in your experiment. Once the data has been converted to CSV format, you need to upload it into Machine Learning Studio. Open the Machine Learning Studio home page (https://studio.azureml.net). Click the menu in the upper-left corner of the window, click Azure Machine Learning, select Studio, and sign in. Click +NEW at the bottom of the window. 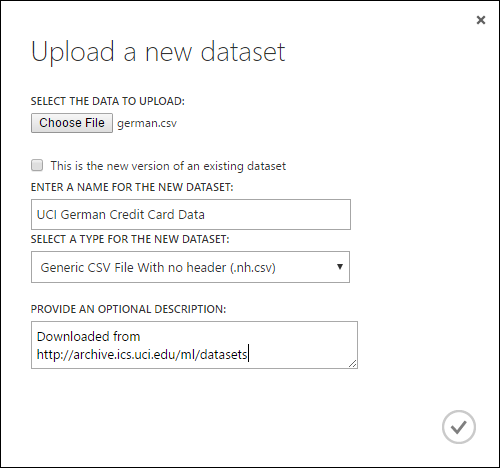 In the Upload a new dataset dialog, click Browse, and find the german.csv file you created. Enter a name for the dataset. 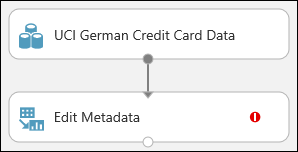 For this tutorial, call it "UCI German Credit Card Data". For data type, select Generic CSV File With no header (.nh.csv). Click the OK check mark. This uploads the data into a dataset module that you can use in an experiment. You can manage datasets that you've uploaded to Studio by clicking the DATASETS tab to the left of the Studio window. For more information about importing other types of data into an experiment, see Import your training data into Azure Machine Learning Studio. The next step in this tutorial is to create an experiment in Machine Learning Studio that uses the dataset you uploaded. In Studio, click +NEW at the bottom of the window. Select EXPERIMENT, and then select "Blank Experiment". Select the default experiment name at the top of the canvas and rename it to something meaningful. It's a good practice to fill in Summary and Description for the experiment in the Properties pane. These properties give you the chance to document the experiment so that anyone who looks at it later will understand your goals and methodology. In the module palette to the left of the experiment canvas, expand Saved Datasets. Find the dataset you created under My Datasets and drag it onto the canvas. You can also find the dataset by entering the name in the Search box above the palette. You can view the first 100 rows of the data and some statistical information for the whole dataset: Click the output port of the dataset (the small circle at the bottom) and select Visualize. Because the data file didn't come with column headings, Studio has provided generic headings (Col1, Col2, etc.). Good headings aren't essential to creating a model, but they make it easier to work with the data in the experiment. Also, when you eventually publish this model in a web service, the headings help identify the columns to the user of the service. 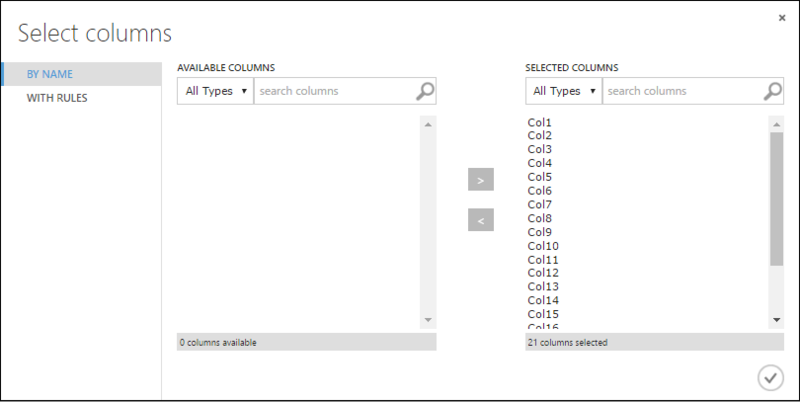 You can add column headings using the Edit Metadata module. You use the Edit Metadata module to change metadata associated with a dataset. In this case, you use it to provide more friendly names for column headings. In the module palette, type "metadata" in the Search box. The Edit Metadata appears in the module list. Click and drag the Edit Metadata module onto the canvas and drop it below the dataset you added earlier. Connect the dataset to the Edit Metadata: click the output port of the dataset (the small circle at the bottom of the dataset), drag to the input port of Edit Metadata (the small circle at the top of the module), then release the mouse button. The dataset and module remain connected even if you move either around on the canvas. The red exclamation mark indicates that you haven't set the properties for this module yet. You'll do that next. You can add a comment to a module by double-clicking the module and entering text. This can help you see at a glance what the module is doing in your experiment. In this case, double-click the Edit Metadata module and type the comment "Add column headings". Click anywhere else on the canvas to close the text box. To display the comment, click the down-arrow on the module. Select Edit Metadata, and in the Properties pane to the right of the canvas, click Launch column selector. 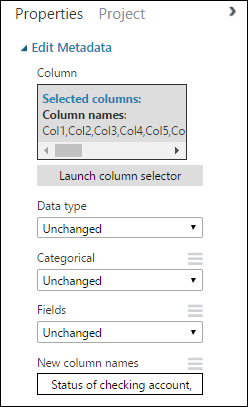 If you want to verify the column headings, run the experiment (click RUN below the experiment canvas). When it finishes running (a green check mark appears on Edit Metadata), click the output port of the Edit Metadata module, and select Visualize. You can view the output of any module in the same way to view the progress of the data through the experiment. You need some data to train the model and some to test it. So in the next step of the experiment, you split the dataset into two separate datasets: one for training our model and one for testing it. To do this, you use the Split Data module. Find the Split Data module, drag it onto the canvas, and connect it to the Edit Metadata module. By default, the split ratio is 0.5 and the Randomized split parameter is set. This means that a random half of the data is output through one port of the Split Data module, and half through the other. You can adjust these parameters, as well as the Random seed parameter, to change the split between training and testing data. For this example, you leave them as-is. The property Fraction of rows in the first output dataset determines how much of the data is output through the left output port. For instance, if you set the ratio to 0.7, then 70% of the data is output through the left port and 30% through the right port. Double-click the Split Data module and enter the comment, "Training/testing data split 50%". You can use the outputs of the Split Data module however you like, but let's choose to use the left output as training data and the right output as testing data. As mentioned in the previous step, the cost of misclassifying a high credit risk as low is five times higher than the cost of misclassifying a low credit risk as high. To account for this, you generate a new dataset that reflects this cost function. In the new dataset, each high risk example is replicated five times, while each low risk example is not replicated. Find and drag the Execute R Script module onto the experiment canvas. Connect the left output port of the Split Data module to the first input port ("Dataset1") of the Execute R Script module. Double-click the Execute R Script module and enter the comment, "Set cost adjustment". You need to do this same replication operation for each output of the Split Data module so that the training and testing data have the same cost adjustment. The easiest way to do this is by duplicating the Execute R Script module you just made and connecting it to the other output port of the Split Data module. Right-click the Execute R Script module and select Copy. Right-click the experiment canvas and select Paste. Drag the new module into position, and then connect the right output port of the Split Data module to the first input port of this new Execute R Script module. At the bottom of the canvas, click Run. The copy of the Execute R Script module contains the same script as the original module. When you copy and paste a module on the canvas, the copy retains all the properties of the original. For more information on using R scripts in your experiments, see Extend your experiment with R.
If you no longer need the resources you created using this article, delete them to avoid incurring any charges. Learn how in the article, Export and delete in-product user data. You are now ready to train and evaluate models for this data.